Running your pistol sans ammunition is a good way to develop a steady sight picture and trigger pull. But there might be a way to get more out of your dry fire training. Dry fire should be an important part of any firearms training, but are shooters getting all they can out of the practice? Grant Cunningham suggests there is a more productive way to get the most out of pulling the trigger sans ammo. Practicing a smooth trigger press is quite difficult with live ammunition; the recoil of the gun masks movement of the sights (and the “feel” needed when first learning the double actions). That recoil also interferes with your ability to judge if you’re correctly maintaining your grasp pressure. Dry firing allows you to divorce the act from the recoil and lets you feel what a proper trigger is really like. Dry fire also makes it easy to feel grasp strength and if you’re maintaining it consistently. Paying close attention to these things in dry fire will make a huge difference in live fire control. While some may scoff at this, I’m generally not an advocate of extensive dry fire practice for defensive shooting. That isn’t to say that it’s completely useless, though, because some – of the right kind and in the right proportion – can be extremely helpful in developing proper trigger control. I recommend doing just enough dry fire practice at home that you develop the ability to maintain a perfect sight alignment for the full stroke (press and return) of the trigger 100% of the time. Once you’ve achieved that, I maintain that further dry fire in isolation is of little value. That doesn’t mean dry fire is completely useless, only that it might be best done at a different time and place. In my experience, I found that once I actually fixed in my mind what proper trigger control felt like, any further dry firing was better done at the range just before live fire. This immediate transition from the lessons of dry fire to the application of those lessons in live fire provides far more benefit than endlessly dry firing off the range. I suggest that when you go to the range start by doing a few dry fire repetitions, perhaps a dozen or so, which will be an immense help in fixing in your mind exactly what your hands should be doing. Immediately switching to live fire allows you to transfer the skills to actual shooting. My students have often reported that doing so makes both their dry fire and live fire sessions much more productive. 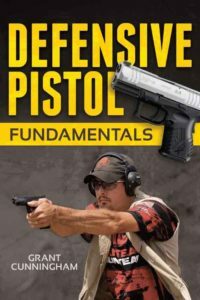 Editor’s Note: This article is a excerpt from Grant Cunningham’s book Defensive Pistol Fundamentals. Why such a narrow depiction of dry fire practice? It’s not just for developing trigger control. Done properly, many other skills come into play which are vital for defensive training; fast draw, proper grip, smooth presentation, rapid sight acquisition, target discrimination, efficient movements, and flawless reloads to name a few. Most public ranges don’t allow drawing from a holster or rapid fire, and practicing reloads from anywhere but the bench is either not allowed or just impractical. All considered, frequent dry fire practice “in isolation” offers tremendous value. That said, I think your tip of warming up at the range with a little dry fire practice is a good one.